There are reasons you may not have heard of prolific and controversial screenwriter/novelist, Dalton Trumbo. I suppose the main reason could be because he’s dead and another might be because you’re unfamiliar with Hollywood history. It’s okay, you’re not alone. It’s also because for a while during his career, he couldn’t have his name on any of the movies he wrote. If he won awards, he couldn’t claim them – all on account of his moral beliefs earning him the reputation of communist. 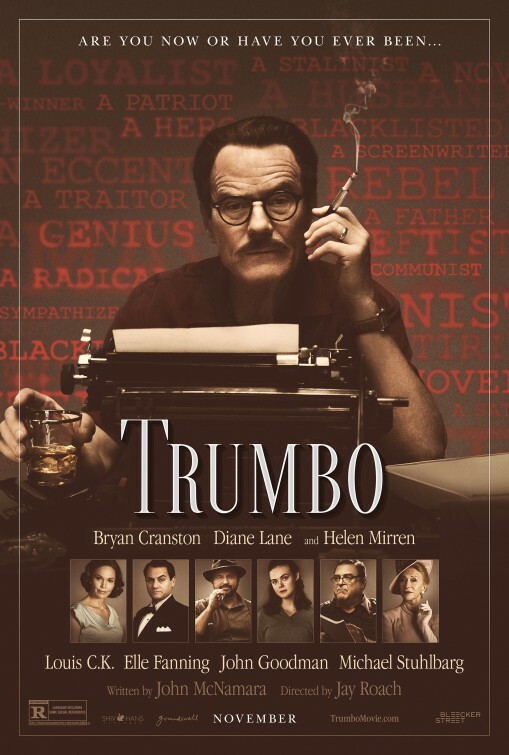 The biopic “Trumbo” is his story and there’s a purposeful irony having this movie’s screenwriter, John McNamara, listed on the movie’s posters, right next to director Jay Roach. That’s something that never happens now and rarely ever happened in the 40’s when Trumbo was working. Another reason you may not have heard of Dalton Trumbo is because there just aren’t that many movies about writer, let alone screenwriters. In 1947, Trumbo (Bryan Cranston) was one Hollywood’s most successful and highest-paid screenwriters. He lived with his wife, Cleo (Diane Lane) and their three children in a beautiful ranch on a lake, just north of Los Angeles. Trumbo and several of his fellow colleagues in the motion picture business (primarily screenwriters and a couple directors) were also unabashed communist, which didn’t sit well with the post-WWII government with the Red Scare of the 50s just around the corner. Such an allegiance became a problem when Congressman J. Parnell Thomas (James DuMont), chairman of the House Un-American Activities Committee (HUAAC), launched an investigation into “Un-American Activities” in Hollywood. This took place in October 1947, prior to Senator McCarthy’s famous investigation in February 1950. 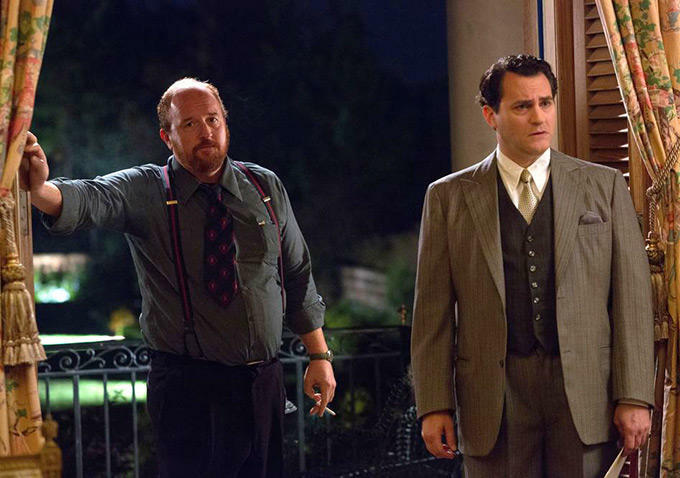 Although, Trumbo and his fellow communists – such as Ian McLellan Hunter (Alan Tudyk) and Arlen Hird (Louis C.K., playing an amalgam of real-life figures in Trumbo’s circle) – stood their ground, they refused to answer directly the “are now or have you ever been?” question before the committee and were convicted of “contempt of Congress” without any substantiation. They felt such questions were in violation of their constitutional rights and indeed they were. Because of their stance, they were blacklisted and Trumbo and nine of this colleagues were deemed “The Hollywood 10” and denied work from studios, damaging their careers, reputation and family lives. This was heavily publicized by Hollywood gossip rag columnist, Hedda Hopper (Helen Mirren), whose work would be seen as newsreels in every movie house. Trumbo served eleven months in a Kentuckey prison, during that time he ironically encountered J. Parnell Thomas who was serving an eighteen month conviction for salary fraud and income tax evasion – an actual crime. During his time in prison, his good friend and liberal democrat, actor Edward G. Robinson (Michael Stuhlbarg), went before the committee and named names, one of which was Trumbo and stated he was under their influences. Actor John Wayne (David James Elliott) a staunch opposer of the Hollywood 10 and “any commie”, stepped in to try and get Robinson some work, since he was free of such a dishonorable association. Upon his release, Trumbo had a hard time getting studios to hire him – even his producer pal, Buddy Ross (Roger Bart) gave him the cold shoulder, for fear his association with a communist would hurt his already flailing company even more. He sold their ranch out of necessity and moved the family to Los Angeles. Trumbo found success though in schlock makers, Frank (John Goodman) and Hymie King (Stephan Root), of King Brothers Production. 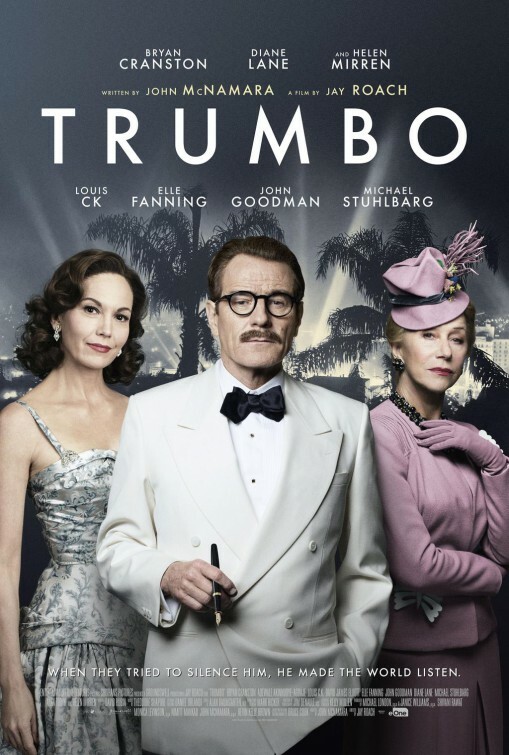 Using over a dozen pseudonyms, Trumbo churned out countless scripts, often revising poor screenplays that were lying around the King Brothers office and making them worthy of production. His penned various features, like “Gun Crazy”, “From the Earth to the Moon”, “The Green-Eyes Blonde” and “They Were So Young” (to name a few), all listed under different names. His long hours slaving away on scripts – often operating out of his bathtub with a steady flow of alcohol and uppers – kept him away from family time, much to the resentment of his eldest daughter Nikola (Elle Fanning), who’s grown into a strong-willed young woman. Indeed, Trumbo became something of a cantankerous grump after prison and by the time the whole “blacklist” business began to wear off in the 60s (due to a lack of credibility), he could benefit from a resuscitation in many ways. It was around then that Trumbo received an invaluable career assist from two Hollywood stars. Kirk Douglas (Dean O’Gorman) sought Trumbo out to find a good story in the 700-page “Spartacus” script he had and director Otto Preminger (Christian Berkel) wanted Trumbo to write an adaptation of the best-selling novel “Exodus”. With both of figures going public with Trumbo’s work for them, there began an acceptance of his work by the general public – this was accentuated by President John F. Kennedy crossing a picket line to go see “Spartacus”. 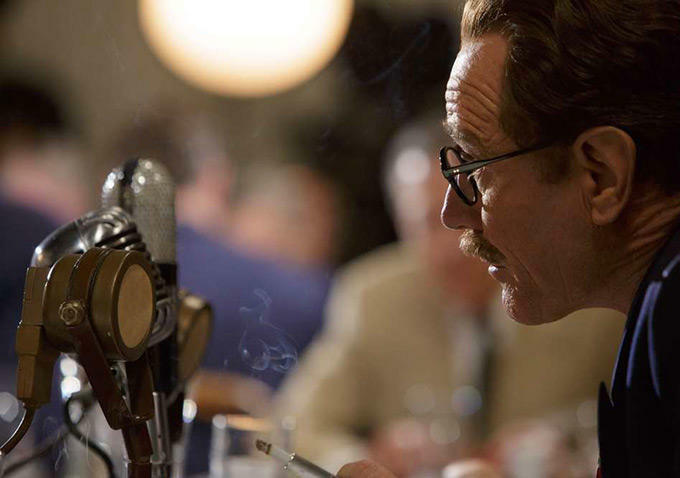 Not every character or occurrence in “Trumbo” is real and it doesn’t need to be. This is not a documentary and certain dramatic flourishes and details are created to service the feature Jay Roach wants to tell. It’s not too far removed from the political dramas “Recount” and “Game Change” that he made for HBO. The director offers the gist of Trumbo’s story by including a variety of accounts and resources. For example, the character Louis C.K. plays is an amalgam of writer friends that stood by Trumbo, as well as drank and fought with. 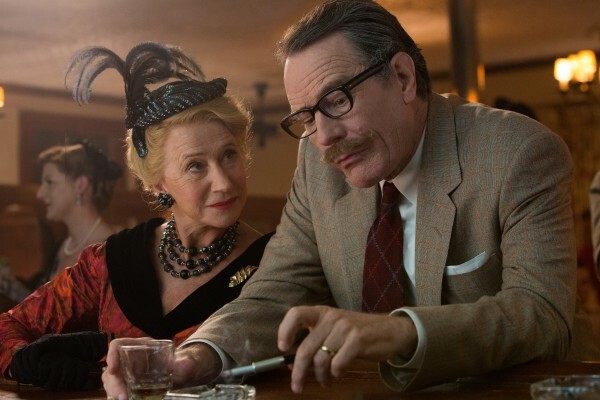 Some of the dialogue between Trumbo and his wife and daughter weren’t necessarily verbatim, but screenwriter John McNamara is providing the general tone of their relationship at the time, allowing the actors to take it from there. Some viewers may have a problem with what is fact and what is fiction in a movie like this – I don’t nor have I ever. Similar complaints were made when “The Social Network” came out. Truth seekers can find out particulars on their own (and actually I recommend “Trumbo: Red, White and Blacklisted” a documentary that came out a couple years back). Again, these are movies, not documentaries, but that doesn’t mean you can’t learn a thing or too – that is, if you weren’t already well-versed in Hollywood history during this time. I learned quite a bit about Trumbo actually, but a couple facts stood out. There were certain screenplays of his that went on to win Oscars – of course, he couldn’t get credit for them at the time. One of which was the screenplay for 1953’s “Roman Holiday”, which he handed over to Ian McLellan Hunter, who shared profits with Trumbo in an under-the-table agreement. Trumbo eventually received a posthumous Oscar for in 1993 for his work on the movie. Also, under the name Robert Rich, Trumbo wrote “The Brave One” which was released in 1956. That film also won an Oscar for its screenplay, but the Academy didn’t recognize Trumbo’s work until 1975. I can’t imagine how awful it would feel to win an award and then being unable to claim it due to your own moral convictions, not to mention everyone believing someone else wrote your work. Out of the supporting cast, Louis C.K. and Stuhlbarg are the standouts. Louis C.K.’s character sort of becomes our gateway to Trumbo’s world, calling his friend out on any self-righteous BS and providing a sobering outside view of Trumbo. Stuhlbarg thankfully doesn’t do a Robinson impersonation. Instead he embodies the character with understandable doubts and fears. 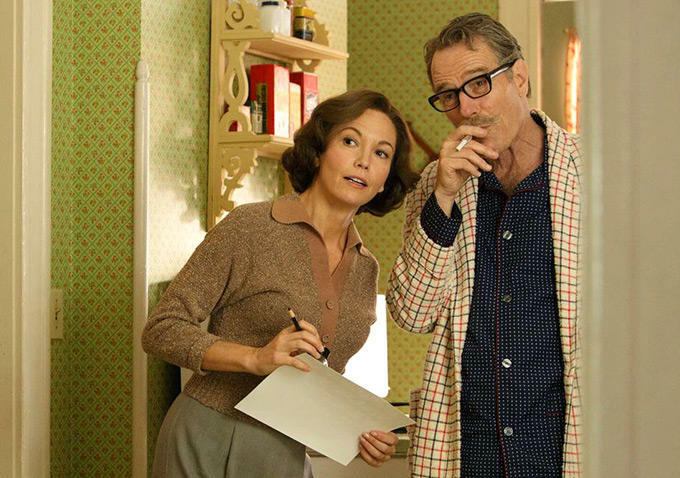 These two roles offered the most nuances and realized characters outside of Trumbo. “Trumbo” has a clever screenplay with several great one-liners from its protagonist, directed in an entertaining manner. It may only attract a specific audience and some may wonder if it’s relevant, but with the way Hollywood has come under fire in recent years for the way they handle agesim and sexism (as much as Hollywood is labeled as liberal), seeing a true story about freedom of expression and equality, is unfortunately still relevant today. You might well consider verifying your (film-parroting?) allegation that Robinson “named names.” What is your source for this claim? What can and/or should be done to correct this assertion if it is in fact incorrect and fails spectacularly to keep things “reel”? thanks for reading. my job isn’t to fact-check or verify what is portrayed or implied in a movie that is based on true events – it is merely to write my perspective about how a movie goes about what it’s about. have you seen “Trumbo”?